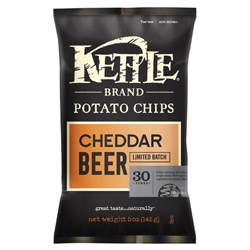 Kettle Chips certainly keep it simple. And so shall we. Color coded bags. Colors associated with the flavor. Minimalist design. Plain but fairly perfect. This special edition design is not quite as good - it goes to the fuss of adding extra words, colors and boxes! If you grab a Chip with a big oil bubble, it will be a crispy crunch. If you grab a relatively flat version it will be a harder, firmer experience, but still a little thin and crispy for a Kettle Chip. These were a fairly light and airy Chip. There was little in the way of seasoning. They were mostly golden yellow, with some darker blotches here and there. They were also rather thin for a Kettle Chip. Less greasy than many of Kettle's Chips.